While clearing my house of its rubbish, I came across the London casino chips. 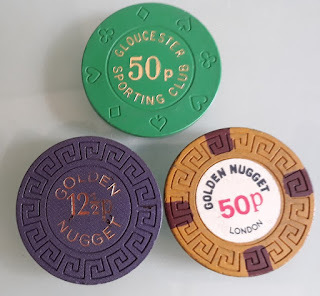 The grey and brown ones were from Golden Nugget Casino while the green chip was from Gloucester Sporting Club. These chips must have been lying in the secluded corner of my drawer for umpteen years. Some of the crew, pilots included, used to gamble at these casinos. The Golden Nugget was frequented by the crew as early as in 1972 when we first night-stopped in London. Gloucester Sporting Club came into existence in the early 1990s. As we were staying at the Gloucester Hotel back then, it was very convenient for the crew to patronise the place (the casino was situated next to our hotel). I wonder how many crew went broke because of these casinos. For information, I understand the above 2 casinos are no longer operating.